PLEASE NOTE: SPECIFIC RENTALS REQUIRE A $600.00 SECURITY DEPOSIT IN ADDITION TO THE TOTAL RENTAL AMOUNT DUE. NO HOUSE PARTIES OR STUDENT RENTALS – MUST BE 25 OR OLDER TO RENT. If a house party is reported or discovered, you will be asked to vacate the premises immediately without refund of any rental amount paid and any damages will be charged to your guest account. A valid id is required at check-in. We reserve the right to inspect the property during your stay if a house party is suspected or reported. Inspections are conducted on a daily basis. CHECK-IN TIME BEGINS AT 4:00 P.M. (You will not be permitted entry to the unit until this time) Please supply our office with a cell phone contact number, we will call you if your rental unit is available for early check-in. CHECK OUT TIME IS BY 10:00 A.M. Our Housekeeping staff will arrive at the rental unit at 10:00am promptly. All check-in and check-out operations are at our office located at 1007 Sea Mountain Highway. All keys are to be returned to our office. There is a $50.00 charge per key for all lost or unreturned keys. There is a $100.00 charge per pier and/or gate passes lost or unreturned. If you will be arriving after 5:00 P.M., please notify us so arrangements can be made for you to pick-up keys from our lockbox located at our office. Monthly winter rates including basic utilities are as follows: electric, water/sewer, garbage pickup and basic cable as noted. Any other services requested by the guest will be the responsibility of the guest for payment and must be approved by Cherry Grove Beach Vacations and the property owner prior to installation. Some properties require guest to pay certain utilities as noted on the property web page. Rentals are Saturday to Saturday during the High Season. Rental rates are based on beach location, condition, and furnishings of unit and number of people it will accommodate. Please inquire for a rental less than 7 days in the Off Season – not all properties participate in winter/monthly rentals or rental stays of less than 3 nights in the off season. Your credit card will be charged for a minimum payment of $225.00 at time of booking. Full deposit or rental amount may be charged to credit card and is subject to a 2% fee. Within ten (10) days of confirming in your reservation, we must receive a deposit of one-half (1/2) the rental amount. Personal check, money order or certified check are the preferred method of payment. We accept Master Card, Visa or Discover. If you choose to use a credit card for payment, a processing fee of 2% will be added to all credit card payments for processing, according to the percentage fee charged by the financial institution for use of card. Cherry Grove Beach Vacations does not receive any portion of this processing fee. If we have not received your deposit within 10 business days, we will cancel your reservation. Upon receiving deposit of one-half (1/2) the rental amount, we will mail a confirmation showing taxes, security deposit, any applicable guest charges and rent balance. Your TOTAL BALANCE is due at least thirty (30) days prior to arrival. This may be paid with a personal check, money order, certified check, Master Card, Visa or Discover. If you choose to use a credit card for payment, a processing fee of 1.99% will be added to all credit card payments for processing, according to the percentage fee charged by the financial institution for use of card. Cherry Grove Beach Vacations does not receive any portion of this processing fee. You will not be issued keys with a balance due. Upon departure, guests will be required to wash all dishes and put away, empty refrigerator and freezer, empty and clean trash cans. All garbage must be bagged and placed by the street or inside community dumpsters. Yard must be free of litter and pet waste. Strip beds of rental linen and leave in unit. Close all windows and lock all doors. Turn off all lights. Cherry Grove Beach Vacations housekeeping staff will provide a departure clean for the kitchen, bathrooms and floors. This departure cleaning is included in your rental processing fee. Check for personal belongings. Any items left in the unit will be held for 30 days and if unclaimed will be donated: otherwise, guest agrees to pay for cost to cover the expense of packaging and shipping to guest by Cherry Grove Beach Vacations (shipped COD). All property will be inspected upon guest departure and failure to leave property in good condition will result in an additional cleaning fee charged to guest account plus any additional damage charges. ALL UNITS ARE NON-SMOKING. Smoking inside of a rental unit will result in a Guest Account charge, charged to the credit card on file. On check-in day, if you are not satisfied with the cleanliness of your rental, you must contact our office within 24 hours. 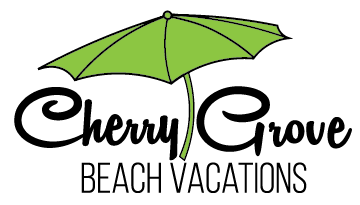 A Cherry Grove Beach Vacations representative will inspect your property and if deemed unclean will see that it is cleaned to your satisfaction. Damage/Cleaning – A valid credit card number is required at check-in to serve in place of a security deposit. After your departure, unit is checked for cleanliness and/or damages. If the unit is clean and there are no damages, the credit card number will be destroyed. If there is a problem with the unit you will be informed of a charge to your guest account. Refunds will be made on cancellations only if unit is re-rented. A $100.00 cancellation fee will be deducted from refund. Linens, towels, soaps, etc. are not supplied. You must furnish your own. Kitchens are equipped for simple cooking and housekeeping. We furnish a starter supply of toilet paper, paper towels and garbage bags. Linen packages can be rented from Cherry Grove Beach Vacations at a rate of $125.00 whole house. Each set includes the appropriate flat/fitted sheet and pillowcases, bath towels, wash clothes, hand towels and kitchen towels. Linens will be delivered to your rental unit prior to your arrival and beds will be made. Upon departure, please leave linens in the unit. Please arrange for linen rental at least (1) week prior to arrival. Linen rental will be subject to sales tax fee. We cannot guarantee appliances or air conditioning. Repairs will be made as soon as possible after they are reported. We cannot issue refunds for mechanical failures. Upon check-in, please check the refrigerator setting. Dial should be on the middle temperatures. DO NOT SET refrigerator past 5 or C. DO NOT overload the refrigerator with warm food. Keep the refrigerator door closed for a minimum of 3 to 4 hours. Air conditioning thermostat must be set on cool, fan on auto, and temperature not below 72 degrees. Please keep all doors and windows closed so the unit can cool properly. PLEASE – NO PETS. If a pet is discovered in a rental unit that is not designated as pet friendly, you will be asked to vacate with NO REFUND and charged a penalty fine at the discretion of the Property Owner. Pets allowed ONLY in pet-friendly homes and require a non-refundable pet fee of $150.00. NO HOUSE PARTIES OR STUDENT RENTALS – MUST BE 25 OR OLDER TO RENT. If a house party is reported or discovered, you will be asked to vacate the premises immediately without refund of any monies and any damages will be charged to your guest account. A valid id is required at check-in. We reserve the right to inspect the property during your stay if a house party is suspected or reported. Inspections will be conducted on a daily basis. All rental units are privately owned; as Agent, we reserve the right to refund deposit, refuse admittance and/or discontinue occupancy if, in our opinion, same is detrimental to the premises. Do not attempt to open locked closets, these are specifically for homeowner use ONLY. Guest will be charged for any damage or missing items from the locked closet area. We cannot guarantee pool use or maintenance of same in complexes. Most private home and condominium complexes close their pool by or during the month of October and re-open their pool by or during April of the following year. Condominium parking is limited. Please conserve – MAXIMUM TWO (2) automobiles per unit. Permits required and no more than 2 permits will be issued. Condominium complexes do not allow for golf carts; rented or personal. No charcoal grills on balconies or porches or walkway areas. Observe ALL fire code regulations. Sleeper sofas are not recommended for adults as they may be uncomfortable. No refunds can be issued if found uncomfortable. If there is a telephone in unit, all long distance calls should be made with a calling card or collect. A $10.00 collection fee will be charged to your guest account as well as the cost of the call, if a direct dial long distance call appears on the owner’s bill. The same will be applied for cable television if any additional services are ordered and unapproved by the owner and Cherry Grove Beach Vacations. Not all properties allow Motorcycles, Motorcycle trailers or Boats and Boat trailers. Be sure to verify if your rental unit does allow prior to your arrival. Self Storage is available in the area for the duration of your stay at your cost.